During times of extreme uncertainty and fear, investors are drawn to gold. In prior centuries, gold was the globally-accepted source of power and wealth for kings, empires and aristocrats. As children we read stories and watched movies about gold: Pirates searched for buried treasure, Indiana Jones (while trying to avoid snakes) was always stumbling over lost caches of gold, Midas had the golden touch and from Aesop’s fables there was a goose that laid golden eggs. As a result, we have a sociological connection and an ingrained belief that gold is and always will be valuable. But how many investors really know the facts on the value of gold in the past 50 or so years? Looking beyond the emotional comfort of gold, a study of the value of gold in the 20th Century results in disappointment. 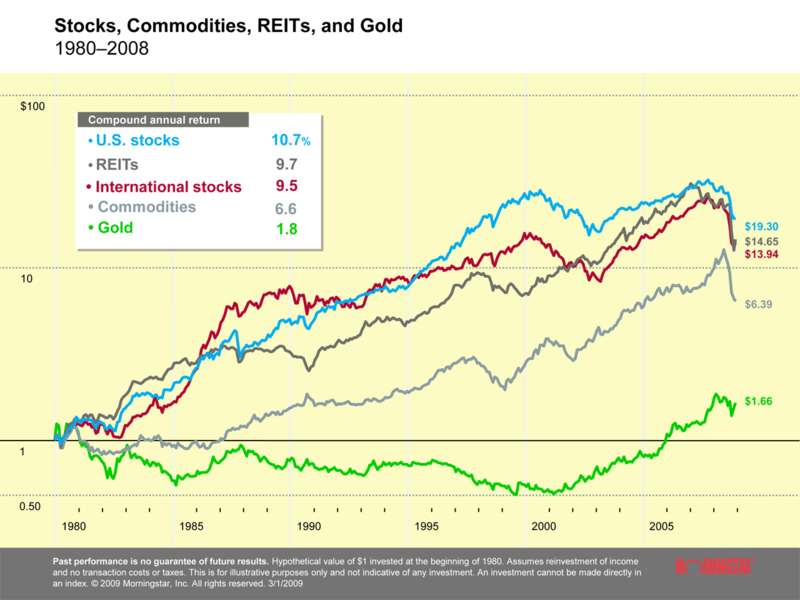 As a long-term investment, evidence provides little indication that gold would complement a globally diversified portfolio. As a short-term speculative investment, it is routinely misunderstood and often the subject of misleading salacious pitches to attract buyers. As a hedge against inflation, it’s unreliable. In 1980 gold briefly reached a high of $850. Inflation was excessively high that year at 13.6%. At first glance gold might appear to be a safe haven in times of high inflation. But what we learn upon closer examination is that inflation was high for the six years preceding 1980 and the two years afterwards. Yet gold was unresponsive to inflation during most of this nine-year period. Why would we think it would be any different in the future if another wave of excessive inflation hit the US? Now look at the figures for average annual inflation, a one-month certificate of deposit and short-term US Treasury bills during that same nine-year period. Here we see strong evidence of correlation among all three, and a rational explanation for it. As inflation increases and the one-month CDs or T-Bills mature, principal is reinvested at the latest yield, reflecting the latest inflation increase. Thus, the CDs and T-Bills are never more than one-month behind the inflation rate. Adjusted for inflation, gold would have to be worth around $2,300 an ounce today to have the same value it reached in 1980. Instead, it took until March 13 of 2008 for gold to reach $1,000 for the very first time. For the intervening 28 years, gold didn’t even keep pace with inflation. Here is another shocking fact: If you had invested $100,000 in gold in 1980 and $100,000 in the S&P 500, the gold today would be worth roughly $200,000. The S&P 500 would be worth roughly $1.9 million. So why would anyone find comfort in gold given these comparisons? Unlike CDs and Treasury Bills, gold pays no income. It is like raw land or collectible art. Gold just sits there. There can also be a cost to store gold, insure it or protect it. If you needed cash, you would have to sell some of it and hope the price was strong at the time. Or, you would need another source of cash flow so you aren’t forced to sell when the price of gold is unattractive. And worse, for the past 30 years, it didn’t even appreciate in value. One could argue that the illustration on the next page is biased because it begins at a time when gold was at its peak. But, given any 10-year or longer time period, a globally diversified portfolio soundly beats gold for at least the last 30 years. Gold can be a poor short-term investment. Any short-term investment is speculative and has to be timed just right to make money. Gold often surges in value during times of uncertainty. The events that create the uncertainty are unpredictable and by their nature unforeseeable. So by the time an investor rushes into gold, the event has already happened and gold has already jumped up in value. In all likelihood they will be far worse off to jump in than if they had just stayed put during the crisis and wait for normality to return – as it usually does. It is usually the gold dealers and advertisers who make the profit. Starting in 2006 and 2007, gold began its most significant increase in value since 1980. But, during this time, inflation has been very low and at times negative. So, high inflation clearly isn’t the cause during this period for its dramatic increase in value. The reason is likely related to the global financial crisis. As the value of gold increases, the more anxious investors may feel. They wonder: What am I missing that everyone else sees in gold? They wonder: Is it is too late to jump in? They hear about it on the radio, television, magazines, and in newspapers. But wait, doesn’t this sound familiar? By many indications, gold may be the latest bubble. It has all the characteristics of a bubble. Our advice is to avoid the speculation and frenzy. It is always a good time to own and enjoy wearing gold. And maybe this is a good time to sell unwanted or unused gold jewelry (although even at today’s prices, you are probably losing money.) But as a solid investment opportunity, gold is more likely to end up as fool’s gold rather than to advance your long-term financial goals. PAST PERFORMANCE IS NO GUARANTEE OF FUTURE RESULTS. Investing involves risk. It should not be assumed that recommendations made in the future will be profitable or will equal the performance shown. Investment returns and principal value of an investment will fluctuate and losses may occur. Diversification does not ensure a profit or guarantee against a loss. This information is for educational purposes only and should not be considered investment advice or an offer of any security for sale. If we define success in life as achieving a sense of peace and happiness, many economically successful people are not successful. Is this because money cannot buy happiness?